C646 is an inhibitor for histone acetyltransferase, and inhibits p300 with a Ki of 400 nM in a cell-free assay. Preferentially selective for p300 versus other acetyltransferases. 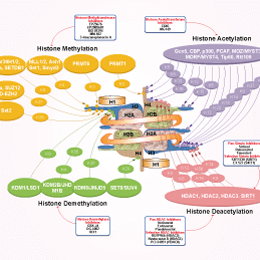 Phosphorylation of STAT6 in butyrate-treated M2-BMDMs. Western blotting was performed with anti-phospho-STAT6, STAT6, and β-actin. Data are representative of three independent experiments. M2:M2 macrophage; But:butyrate. A-485 is a potent, selective and drug-like p300/CBP catalytic inhibitor with an IC50 of 0.06 μM for p300 HAT. It is selective over BET bromodomain proteins and >150 non-epigenetic targets. WM-1119 is a highly potent, selective inhibitor of lysine acetyltransferase KAT6A with IC50 of 0.25 μM. It is 1,100-fold and 250-fold more active against KAT6A than against KAT5 or KAT7, respectively. Anacardic Acid is a potent inhibitor of p300 and p300/CBP-associated factor histone acetyltranferases, which also has antibacterial activity, antimicrobial activity, prostaglandin synthase inhibition, and tyrosinase and lipoxygenase inhibition. Western blot analysis of α-SMA expression in whole-lung lysates. Data are expressed as means ± SEM, *P < 0.05 versus vehicle and #P < 0.05 versus PQ (n = 4-6). MG149 is a potent histone acetyltransferase inhibitor with IC50 of 74 μM and 47 μM for Tip60 and MOF,respectively.